Some weeks feel more productive than others, and this week was one of them. (Makes up for last week!) And although I did not manage to do much on the quest I am currently working on, I did manage to complete a number of peripheral projects instead, complementing work I have written about in previous weeks. In last week's blog, I mentioned a player could launder items that they may have "acquired" illegally. There are two purposes for this: (1) The player can then sell the items at any store that buys such items (as opposed to black market stores only), and (2) If approached by an officer of the law, they will have nothing to hide when searched. Wherever the law is upheld, there is always a risk of being searched from time to time. There may even be some places where one is searched more often, and being caught with stolen goods is obviously not beneficial. When approached by an officer, the PC (party) can choose to be up front (and play innocent) and turn over any stolen goods without any further issues. Alternatively, the party can choose to try to conceal the stolen goods (or risk the guard will not be aware certain goods are stolen) and get away with them. Any items the guard recognises, however, will be confiscated and a fine will have to be paid, unless the party decide to defend the goods by attacking the guard(s) instead. Some guards will be more observant than others and the same guard may be more or less observant at different times. Furthermore, a PC has better chance of concealing a stolen item according to their sleight of hand skill. Even if caught with stolen goods, the party have a chance of talking their way out of the situation and keeping the goods or not paying a fine according to their conversation skills. This is just another aspect of of the real life system I am trying to design with the campaign, which also enables a player to make better use of their PCs' skills. I mentioned this nearly two years ago, but have only now managed to put together the first batch of spells that make use of the system to be available in this module. 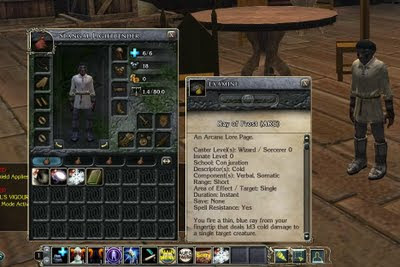 A unique system of magic use, based upon the history of the campaign, Arcaene Lore offers the spell caster a way of accessing spells that have not been learned for the day. This system has always been one I have intended to include in this era of the campaign, and even from the days of playing pen and paper D&D I have always included a way for players to be able to cast any spell that they have in their repertoire. The reason for this is to help prevent the need for players to having to rest and relearn a certain spell for a one-off situation. E.g. The wizard has not learned the Knock spell and the party come across a locked door. If the wizard had the Arcaene Lore spell Knock, then they would still be able to cast the spell as long as the wizard had another 1st level spell memorised to sacrifice in its place. Without the Arcaene Lore version, the wizard would have to rest and learn the spell as usual. 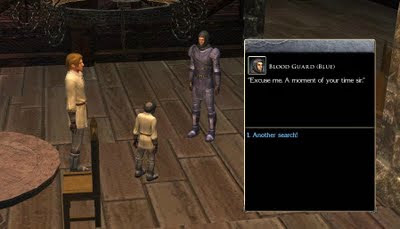 Thinking about this practically, I don't believe the PC would normally sit around eight hours just to learn a spell to get past a door, and so returning to my real life approach to the game once more, I felt the Arcaene Lore system was something the game had to include to overcome this illogical and impractical aspect of the whole D&D game. Players from the PnP days will be used to this style of play anyway, as the Colour Magik system offered a similar style of play. However, as this module is both a first as a new era for Althéa and a first to be played by those not familiar with such a magic system, Arcaene Lore will be introduced more gradually, with only a few spells being available at a time. Hopefully, I will start with the more obvious spells that a spell caster would desire, but, in time, a PC should hopefully collect enough to help free them of the kinds of frustrating bonds of learning and practical use I mention above. I am gradually working my way through the spells, altering certain aspects as I see fit. Many have additional lines already added to allow for a more dynamic crafting system and some for longer durations or other minor alterations. 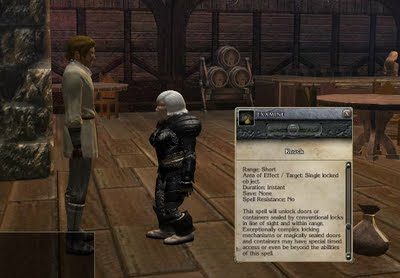 All changes will be noted in the spell descriptions if examined, and so it is worth a player's time just to quickly examine each spell as they gain them to note any differences. A spell I altered this week was the Knock spell. This has been made to work more closely to the 3rd edition, targeting a single object only (but short range). I edited my tlk file and the spells.2da to reflect new descriptions and targets possible. I have also made it clearer when a target resists the magic and when a target may have limited benefits only, like when targeting my own new Combination Chests. On the subject of spell alterations, I would like to quickly raise the question: Has anybody noticed any spells that do not work properly with respects to saving throws? This problem was highlighted to me when I was playing the final battle in SoZ with my friend and our wizard was always failing a saving throw against mind spells, even though she was immune to such. See this forum post. I traced the problem to a missing GetIsImmune check for the condition it was dealing out. You will see in the post that I noticed a PC had a better chance of saving against the condition if they were *NOT* immune to the condition in the first place. I want to correct any spells that may have this problem prior to any release and so any information about this problem is appreciated. You may have picked up a common theme in this week's post: bypassing locked items. Using the skill Open Lock is another way to bypass a lock. However, in my tests this week, I noticed that picking locks has become a past-time that any class of PC can achieve even with a modicum ability in the Open Lock skill ... as most lock DCs are set at the moment. Call me a traditionalist, but I liked the fact that Pick Locks was originally a class ability of the Thief class (now called Rogues) only. In other words, if you weren't a thief, you could not pick a lock. That said, I am not too traditional not to recognise the fact that any class of PC could *potentially* pick up the ability to pick locks, and from that point of view, I like the fact that any class of PC can have the skill Open Lock. Having established my standing, I decided to look closer at the DC value to open a lock and the way the skill worked. Closer examination revealed that the Take Twenty rule kicked in more often than not. Added to this is the PC's skill rank and any dexterity bonuses. Furthermore, this figure can be boosted by any Thieves Tools they may be using, offering a +1 to +10 bonus. Assuming a 1st level PC with a dexterity of 18 has trained as high as possible in the Open Lock skill, they could potentially open a lock of 38 DC with the right equipment! Using these new DC values, it now moves the ability to pick locks back to those PCs who are going to spend time investing skill points into the Open Lock skill. It also means that even a failing inferior lock may still require a PC with the Open Lock skill to acquire some tools to do the job! And considering most locks the party (the pilfering rogue in particular) encounter should be simple or good locks, then it can be seen that the PC now needs to specialize in this ability if they want to get anywhere with it.